PanARMENIAN.Net - As а native speaker of Armenian, it’s hard to imagine that people are capable of mastering your language so well as to perfectly speak, write and express themselves in Armenian. Conversing with Benedetta Contin, an Italian scholar who has put her heart and soul into learning the Armenian language, I was amazed at her ability to convey her thoughts in such a beautiful manner. 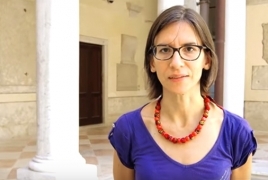 Benedetta currently teaches old Armenian in Mekhitarist Congregation in Venice where Lord George Gordon Byron came in 1816 and immediately became fascinated by the beauty of the Armenian culture and language. While the Armenian version of the interview was unchanged to give a better understanding of Benedetta’s proficiency and devotion, here is a short walk through her thoughts about the Armenian language, its peculiarities and beauty. The wish to master the Armenian language crawled up to me little by little, especially after I visited Armenia. And it became a kind of challenge for me to absorb everything that had anything to do with this sweet and at the same time bitter language, from Grabar (Classical Armenian, also known as Old Armenian or Liturgical Armenian - the oldest attested form of the language - Ed.) to the two types of modern Armenian (Eastern and Western - Ed. ), from Mesrobian to Soviet orthography. The Armenian language resembles the soil of Armenia, its accent, phonetics and harmony reflecting the mysterious colors of fertile and enticing nature. In a word, how can a person in love explain what their object of love is? This can’t be conveyed in words. I started studying Greek, Latin and Sanskrit at the oldest university of Europe in Padua, which is also my birthplace, but I wasn’t that enthusiastic. And then I realized I am more interested in Oriental languages and cultures than the Greek world which I had learned a lot about while attending the lyceum. So I decided to move to the Ca' Foscari University of Venice and registered myself at the department of Oriental languages there. Venice became a real discovery for me like it did for Abbot Mkhitar three centuries ago (Mkhitar Sebastatsi - an Armenian Catholic monk, as well as prominent scholar and theologian who founded the Mekhitarist Order, which has been based on San Lazzaro island near Venice since 1717 - Ed.). I had the great honor to learn from Father Boghos Lévon Zékiyan, a prominent Armenologist and Archbishop of the Mekhitarist Congregation. A new horizon of the Armenian culture, civilization and worldview thus opened before me, at the same time helping to better understand of my Venetian heritage and identity. My husband is Armenian and we speak both Armenian and Italian with our three children as it’s very important for them to not just speak Armenian but to also realize that they belong to two exquisite cultures that have given wonderful pieces and infinite beauty to the humanity. They should be proud of and cherish such a historic background. I speak the Venetian dialect of Armenian so my diction is a but accented, but Armenians are usually very polite and haven’t told me anything so far. No matter what, I am proud of what I know. I currently work for the Foundation for Religious Sciences John XXIII (Fondazione per le Scienze Religiose Giovanni XXIII) in Bologna where I was asked to prepare a volume about the Armenian Church Conventions for Brepols, a famous international publishing house. Also, I teach Grabar to the newcomers of the Mekhitarist Congregation on San Lazzaro island. At the same time, I am the deputy president of Padus-Araxes Cultural Association and the deputy head of the Summer Intensive Course of Armenian Language and Culture in Venice. My area of study focuses on the history and background of Armenian thought and philosophy. My dissertation titled “David the Invincible and the School of Alexandria: Research on the formation of the epistemological vocabulary of Greek and Armenian works” has just been published in French with the support of the Orientalia Christiana Analecta of the Vatican (Benedetta Contin, “David l'Arménien et l'Ecole d'Alexandrie. Recherches sur la formation du vocabulaire épistémologique des oeuvres grecques et arméniennes”, Orientalia Christiana Analecta, Roma 2017).